Ooo! Yay! Melting things!! Ever since our shrinky dinks phase, my daughter and I have really enjoyed crafts that involve melting things. 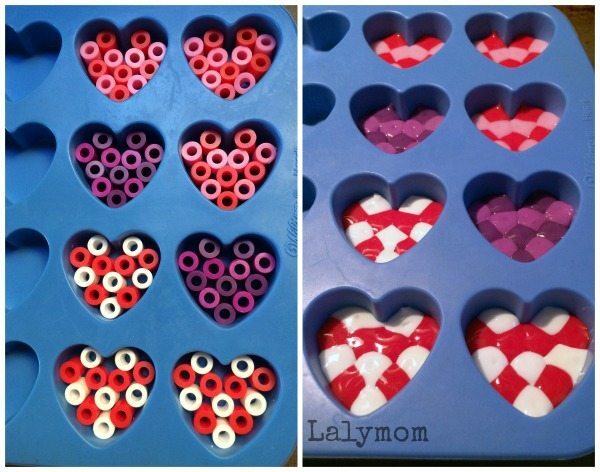 Today I'm sharing some cute Valentine's Day magnets that we made out of melted pony beads! We have never used melty beads in a melty fashion before. We have made a DIY abacus out of them and did some melty beads activities with them in their unmelted form. Our fun Mooseltoe activities also left us with some extra pony beads and tri-beads. 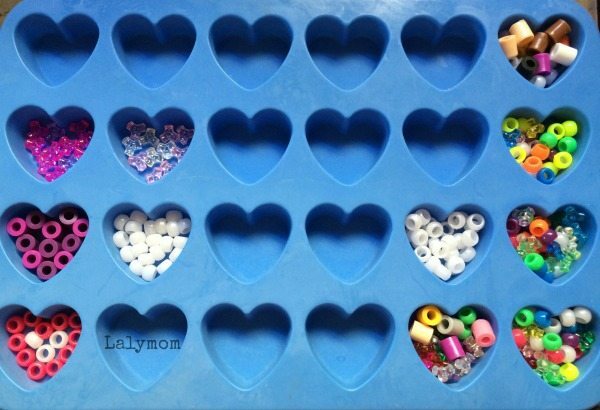 We found a fun and easy way to turn our beads into super cute hearts. We made our hearts into magnets but you could also make them into other things, like maybe sun-catchers, a tic tac toe set, or maybe even a key chain. I'll give you the melted pony beads and melty beads tutorial below, but I just wanted to mention that I use affiliate links in this post. Okay. Here's the deets! We tried three types of beads. Depending on your desired results, you can take your pick. We tried all of them in our silicone baking molds with no prep or other treatment needed. Transparent Colored Tri-beads – These are clear and melt glass-like. We liked them but it was a little difficult to get them to fill in the entire heart using only tri-beads. They are the clear spots in the muti-colored hearts. Would be pretty for a sun catcher though, since it would be okay if there were holes! You can also try laying the beads two layers deep to fill the whole heart. If you melt them one at a time they actually end up in a triangle or heart shape, which is cute but you can't do a ton with them. Pony Beads (ours were sent to us by CraftProjectIdeas.com) – These melted very nicely and evenly and stayed true to their colors. We used them for the totally white ones. They came out the smoothest if you turn the pony beads all sideways, and put them in one flat layer, with no holes showing, versus just dumping them in and leaving them. Perler Beads (our Melty Beads were also sent to us by CraftProjectIdeas.com) – These are meant to be melted with an iron so using them in the oven is a little different. We did have one that was white end up slightly yellowed. We used them for the matching sets. They did better when they were all in one layer and all in the same direction. Silicone Molds. We have these Wilton molds, but they seem to go in and out of availability on Amazon. If you can’t find those available, this set appears to make fewer of the same size hearts, maybe slightly deeper. This set looks like it make slightly smaller hearts but is cheaper. As long as you are using silicone molds it should be fine. The hard plastic ice cube trays are not what you want. Round Magnets if you want to make them into magnets. Once again ours were given to us by CraftProjectIdeas.com and the ones on Amazon that look similar do not get the best reviews. 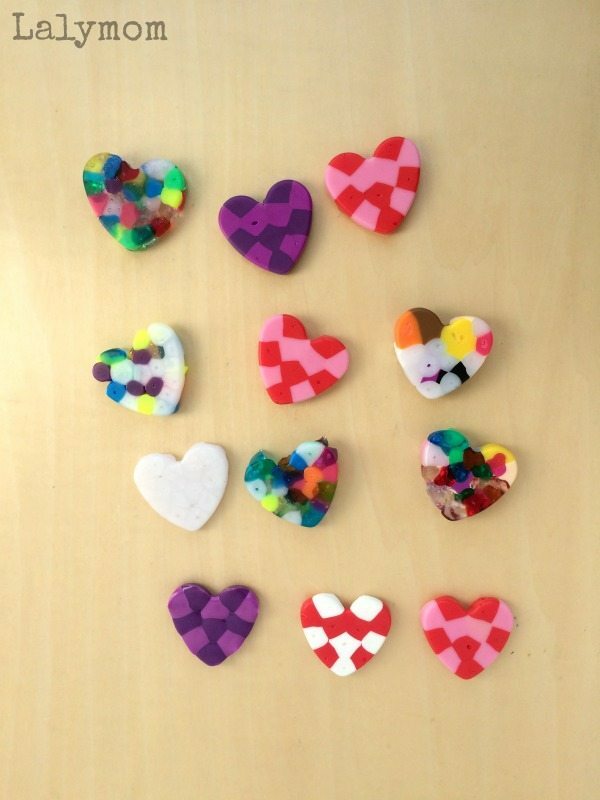 These magnets get good reviews but would require hot glue to attach them to the hearts. Just be sure to put away the magnets and make sure to supervise your kids around magnets. We preheated the oven to 325**, placed the silicone mold onto a baking sheet for stability, and left them in the oven for about an hour. Put your hood fan on to vent the air. One reader wrote in to say that it took a couple days for the fumes to air out of her kitchen when she did this. We always have our vent fan on when we do anything with plastics in the oven. I don't recall having a big smell when we did it, but every brand of beads is different and I can't guarantee whether you would notice it or not. Either way, it couldn't hurt to crack a window and turn on your fan if that would bother you. A second reader, Michell had a pretty bad experience with this craft, saying they melted and caught fire in her oven! YIKES. After we emailed a bit about it, we did not know if it was the beads or her silicone mold that was the culprit but she had her oven up to 400 degrees whereas I had mine at 325. Usually silicone molds are rated up to 500 degrees since they are made for baking but be sure to check the brand you are using for the temperature rating, and check the directions on the beads you have to ensure your own project goes smoothly! It's possible that the higher oven temp heated the beads up too hot and melted the mold. Otherwise, everybody has enjoyed the project but I felt it best to share their experiences, because, yikes I don't want any more of THOSE results! You can check on them sooner than an hour, but it took a long time for ours. I thought I'd try a batch with the oven higher but they melted more uneven. I'd stick with low and slow. If they are not flat, leave them in longer. Once you take them out, let them cool fully and then just poke them out of the silicone mold! Woohoo! If you do have any sharp points on yours you can use sand paper or a nail file to smooth them out. To make ours into magnets we just used the adhesive on the back of the round magnets. Using hot glue would be the best bet, though! Tie a string through a hole in one for a sun catcher or make a matching set for a tic tac toe set! Be sure to let me know if you try making these Valentine's Day magnets. I'd love to hear how you did. For more Valentine's Day fun, check out my Valentine's Day Page and follow my Valentine's Day Pinterest Board! How long is long? An hour?? Longer? The perler beads at 400 for 20 minutes left behind a toxic fume that will take a few days to air out. Oh I’m sorry you had that experience, I generally run my vent fan any time I do “crafts” in the oven, but I don’t recall a huge smell with the brand I used? I hope they turned out good otherwise, and I’m sorry again. She said 325. Not 400.